More Infinity - Holiday style! Well, I made a weird New Years Gaming Resolution, and that is to not buy a single model in 2013. So just my luck that on Dec 27, 2012, my gigantic 15mm Modern Soviets army shows up! A few guys and I decided that we should branch out into the Cold War what-ifs, and when deciding on scale, 15mm had a number of benefits, chiefly that we already had western european and desert terrain in this scale, and when I laid eyes on that pic WWPD Steve took of the NVA tanks, I was sold. I decided to run generic Soviets, which can be used as Syrians, Egyptians, basically any Communist country from late sixties to the 2000's, so long as you don't rivet count, as BTR60/70/80 its really only the turret that differs, and the T-54-T90 pretty much look similar. The actual models I got represent mid 80s Warsaw Pact stuff. First test models, left is Red Dawn style Spetznaz, right is more generic 3 tone camo. I picked the one on the right. The spackle when wet is pink, white when dry, so you can tell these are "fresh" pics! Battlefront WW2 russian test models in 3 tone, based on pennies, in front of their ride (QRF Miniatures' BTR-80A). Force on Force is a very loose ruleset, where the individual guys can be based like this or in fire teams of 3 or 4 (BMP squads are 2 fireteams of 4, BTR squads 2 of 3 men each, 3 others man the BTR) After seeing many folks using the Flames of War style bases, and even the FoF rules, individual model facing doesnt matter, you add up the fireteam firepower and roll dice, I think I will go with 4 man fireteams per base. In my case, QRF miniatures sells a Motor Rifle Squad as Lead, PKM machinegunner, RPG7 AT guy, and 5 AK74 guys. RKelly is doing Canadians, and QRF Miniatrures is the only way to get a few Cdn vehicles, while Mark is doing West Germans. Yes, they kept WW2-sounding names, like Luchs PanzerSpah vehicles, Marders, but have moved up the feline tank name tree to Leopards! Below is a little video I made just before Christmas (and before all this loot got here) of my test models. Command BTR, Company Command squad, 3 x AT Guided Missile teams. T-72 Platoon (5 tanks) My order was expensive compared to the other guys' because I wanted to be able to run either full armored, full Motor, or a mix. 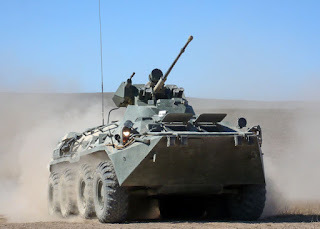 BRDM scout car with Anti tank missiles x 4. Not going to lie, its weird seeing your anti tank assets mounted on such a flimsy vehicle! I am used to beefy ISU-122s. ZSU-23-4 quad AA vehicles x 3. This is more for show, as I love the models, and I wanted something to go with..
And the Mi-24, probably the second objective, though some rulesets (Cold War Commander) allow them. Again, badass looking vehicle and was a must-have. Chris and I got our new starter sets out and had a couple quick games. We recorded them so we can review all the things we did wrong. I decided to post it anyways, to kick off the blog covering a new games system. I started looking for a small scale, sci-fi skirmish game a couple weeks back. Why? I think it comes from the desire to paint something other than 15mm for a change (been working on FoW almost exclusively for over 2 years) along with a vehicle to set up casual game nights, with a game system that can be used to play out campaigns and quick scenarios in 60-90 minutes. I know, I know, FoW affords us this luxury also with Tank/Infantry Aces. But I am planning a full Market Garden campaign to coincide with the new book releases, and I still wanted to change up my painting. Hence my search. The first game I tried was MERCS. Diragi was kind enough to play out a couple games using the free quick start rules from their site (http://www.mercsminis.com/). While enjoyable, the "card based movement" felt restrictive to me, and the forces seemed to favor, for lack of a better term, gimmicks. The setting was great, but the models were definitely 1st generation - I wasn't overly impressed with them. Then I tried Infinity (http://www.infinitythegame.com/infinity/en/). Take a minute and go look at their model line. Ok, now go back and REALLY look at those models. They are 28mm - TRUE SCALE. They are proportioned. They are not "heroic" - or GIANT GOOFY HANDS/HEADS scale. The dynamic poses, along with the diversity of model style made me pick them out. Did I mention the box set was $37.75 at our local FLGS http://www.boutiquefdb.com/en. Suffice to say I was stoked when I read on the "Beginners" forum that all the factions can be built out to play in any style. Like heavy armored troops - they have em! Light, fast moving - check. Close Combat focused - Yu Jing have FREAKING NINJAS! Like mechs/bots/drones - they have them in spades also. The glorious part of this whole thing? Low model count. That's right - low count. Quick games are ~150ts, that's about 5 models. Fully supported international tournament games? 300pts. Roughly 10-12 models, regardless of faction. So I have started painting the models, and I have played a few games, and I am loving it. Several of the guys have picked up starter boxes also, so you may see more posts on their progress also. Expect some pics of my models over the coming days! Soviet Tank Army Build: DONE! Crashed YaK-3P I had a spare British Objective after making Monty's Humber, so I repainted this one to be a YaK-3 (inline engine like the Hurricane/Typhoon, so looks similar) and I was looking up pics, turns out Free French (of the communist persuasion I am sure) pilots flew Soviet planes in the Normandie-Niemen squadron. Given I have Free French army, I kinda had to paint the wreck in this scheme! Behind the '24' note the 2-tone mud effects. This is a large splotch of drybrushed US Tan Earth 874 then stippled on smaller patches of the darker, Flat Earth 983. I did these on the road wheels as well, but its tougher to see when not on the faded white. As usual, final build video is below, enjoy. Next up, I have to decide whether to go guns blazing on my DAK for MW tournament in April, or to finish my Brits, which would entail repainting the following: 8 Crusaders, 6 Grants, 3 Recce Carriers, 4 x 25lbr battery. Tough choice. So, this is the start of a journey. A journey to the World War 2 American experience (kind of). I am embarking on Late War Americans. I was looking to start an Allied Late War force, and wanted to play something "different". Not nessesarily different from the whole meta of Late War, but different from anything anyone locally is playing. That meant armored cars, or recon. So, with the new books having tons of cool toys for Americans in late war, I hitched my wagon on to the Cavalry Recon train! I plan to run more than the minimum recon requirements, and really play a fast and brittle list. I am artificially restricting myself to ONE (1) Tank Destroyer platoon, to keep the list fun for my opponents to play against (I also don't see the need for more than one to be effective - unless all you want is 2 turn Alpha Strike games). This is just a jumping off point. The idea is that I get some "basics" that I can then roll into either a dedicated Armored Rifle Company, or Tank Company later on! So the ARP and Hellcats are assembled, and as can be seen, I have the urban bases from BattleFront for all my infantry - it's still undecided if I will make the winter urban bases - we'll see. So stay tuned, I plan to chronicle all the assembly, painting of the army, and any list changes. You may also see the AARs as I learn the play style as I hope to post them as well. The Cavalry recon units are in the mail, so expect a post in the coming days when I receive them!